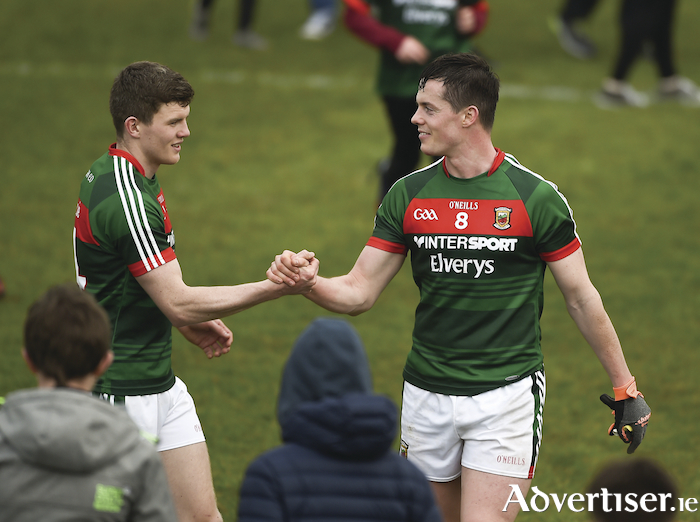 Job done: Eoin O'Donoghue and Stephen Coen celebrate Mayo's win over Kildare last Sunday. Photo: Sportsfile. Just as the evenings start to get a bit of a stretch in them, Mayo got a bit of a bounce to their game last weekend as the battles that lie ahead this summer come more into focus. While the victory was the most important thing last Sunday in Newbridge against Kildare, the manner in which Mayo went about dismantling Cian O'Neill's men in a vital clash will have been very pleasing for Stephen Rochford and Mayo supporters. Big name players like Andy Moran, Aidan O'Shea, Kevin McLoughlin, Cillian O'Connor, and Lee Keegan all stepped up to the mark and led from the front foot right from the off against Kildare. It will have also been pleasing to see the Tom Parsons get some much needed game time in the middle of the park, as did Seamus O'Shea, with both men working their way back to full fitness. Mayo's scoring return is something else that will have greatly pleased those watching from the sidelines with all six starting forwards getting on the score sheet over the course of the game, with the spread taking the pressure off Cillian O'Connor's shoulders. O'Connor's younger brother Diarmuid also looked to be finding his form again after some struggles of late, his point deep in first half injury time reminded everyone of the talent that he has as an attacker, along with his all action running game - which always delivers selflessly for the team. Sunday was also an opportunity for Adam Gallagher to show what he can offer, the Mayo Gaels' man who had been in excellent form for NUIG through the Sigerson Cup put in a solid shift and finished up the day with two points - shaking off a rusty start to the game to get involved in the thick of the action. Rochford also gave Rob Hennelly his second start in as many games and the Breaffy custodian put in a solid shift, pulling off one good save and landing two long range points from frees, and finding his man with the majority of his kick-outs on a tight field. With Galway looming around the corner in less than two months time - Mayo are starting to find their form and get most players back to full fitness. There are a few big names still trying to make their way back, with Brendan Harrison out until after the end of the league at least, while Donal Vaughan, Evan Regan, and Chris Barrett are also not expected to play any part before the end of this competition. As it stands in the league table at the minute, Mayo are level on four points with Tyrone and Kerry, sandwiched between those two in fifth place on points difference. The Red Hand men picked up their second win of the league last Saturday night in Healy Park in Omagh with a 2-13 to 1-10 win over Donegal. Mickey Harte's men hit a goal either side of the break - through Niall Sludden and Mark Bradley to swing the contest in their favour against a Donegal side that had been looking impressive up to that point. Donegal did close the game back to just three points late on, but Tyrone pushed on again over the last few minutes to tag on three points to run out six point winners.